Chinese dragon renderings generally have the nine basic elements of this revered and powerful symbol. Chinese dragons have the head of a camel with the eyes of a rabbit, the horns of a deer and the ears of an ox. Their abdomen is like a cockle and they have a neck is like a snake. Their body is covered with scales of a carp and their tiger like paws have claws like an eagle. Hanging a Chinese art dragon in your home or place of business brings the protection and power of the dragon into your space. The dragon art also draws and increases the flow of positive energy called sheng chi. Chinese dragons are made from parts of nine different animals. They have the head of a camel, the horns of a giant stag, the eyes of a rabbit, and the ears of a bull. The belly is like a clam and the neck is like a snake. They are covered with the scales of a carp, have the paws of a tiger and the claws of an eagle. Dragons are a powerful symbol in Chinese lore, representing both strength and wisdom. 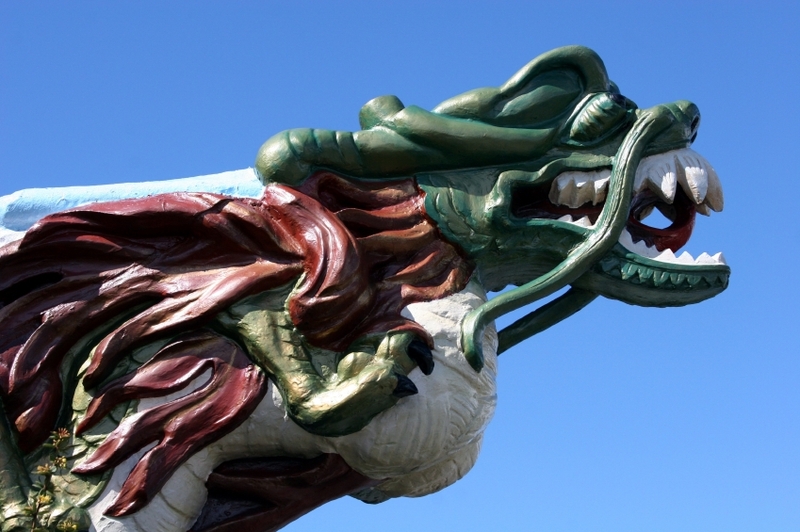 Chinese dragons are generally attributed the ability to fly, despite their lack of wings. Chinese dragons are generally friendly, wise and beautiful, unlike their counterparts in the West. Western dragons are generally depicted as evil flying creatures that breathe fire. Dragons represent the masculine yang energy in feng shui. Symbolizing success and prosperity, the yang force is strong, creative and active. Adding dragon art to your home is an excellent way to achieve balance in your space. In many depictions of Chinese dragons, they are accompanied by a traditional "shining pearl." Some link this pearl to the beast's association with the sun and other celestial orbs, while others think it represents the celestial dragon's love of jewels and gems. Eastern dragons represent a spiritual symbol and heavenly powers. Although they do not have wings, they have the ability to fly. They also are known to have supernatural powers and the power to change shapes. As shape shifters they can become a large as the universe or as tiny as a silkworm. They can take any form even human. Adding a single dragon statue to your home or garden brings protection, good luck and prosperity. It also symbolizes new beginnings and vitality. Two dragons symbolize unity and a group of nine dragons promotes a long life. Chinese dragons were believed to be Chinese gods. It was also believed that the emperor was a direct descendant of the dragons. Referred to as the divine mythical creature, Chinese dragons are known as the angels of the Orient. They watch over the people keeping them safe from harm. As celestial creatures, their breath is the universal essence of life, sheng chi. To view another slideshow of dragon art and feng shui visit Art Dragon Metal Work and Dragon Artwork.